Wouldn’t it be great to find KPIs that instantly inspire teams to execute strategy, reach targets and boost performance? Good luck with that. The cold hard truth is that no KPI can inspire people to strive for more or aim higher. Would you be motivated by a quantitative measure that someone handed to you and told you was important? Of course not. KPIs or performance measures must have context before they can be meaningful. And the context of any measure is the goal it is evidence of. The goal that the KPI helps us achieve is what should inspire people. If people don’t believe in what they’re aiming for, no KPI in the world will make a real difference. To tap into the motivation and engagement that’s required for any goal to be achieved, people really need to feel the goal’s importance. Not just know that it’s important. This means that a team needs to be part of the formation of a goal in order to truly be inspired by it. Only when a team is inspired by a goal, can KPIs become relevant. 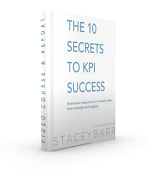 KPIs are tools to help us achieve our goals sooner, and with less effort. KPIs help us reach our goals sooner and with less effort because they point out where we’re wasting time and energy doing what doesn’t help. When we feel inspired by the goals we’re aiming for – by the results we want to improve or elevate – then KPIs have a purpose and a place in our work. But no matter how well designed or beautifully presented a KPI is, it can’t ever inspire us. It can only inform. It’s the goal that lights us up inside with inspiration. The KPIs light up our path to achieve it. Where do you have goals that aren’t inspiring people? Get the goals clear and vivid and compelling first, then find KPIs that light the path to achieve them. Congratulations on riding with Stuart and gaining clearance tor the last portion of Tour de France! Your posts encouraging transparency to create sound measures that affect change are validating and inspiring. Thanks Evelyn! It was a special experience, for sure. Hope you’re able to put some of these measurement ideas into practice, too. Another good post Stacey..I used it in my blog post this month. KPI Performance & Business Marketing combined results is a requirement.